In many places the first whisper of spring comes from the daffodil heads that start poking up out of the ground. At first they're just green, curled up buds, but soon enough they burst into full yellow flower letting everyone know that the weather's been warm enough to thaw the frosty ground and everything is waking up and getting ready for a growth spurt. It's nice to welcome spring into your home with flowers, but what's even nicer than picking flowers to display at home is growing flowers in pots – they last a lot longer and you get the pleasure of watching them bud and burst, not just droop. Spring bulbs are some of the loveliest, brightest flowers around, and they're really simple to grow in pots because for most of the year they're dormant – just the bulb of the plant, which looks a bit like a bulb of garlic survives – and you can remove them from their pots for ease of storage. If this is your first year and you're buying your bulbs choose ones that are plump feeling, and not soft or shrivelled. 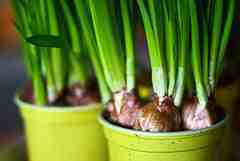 If you buy 'prepared' bulbs they're more likely to flower sooner – you can also buy bulbs reared to grow indoors. But you don't have to. Lots of flowers can be grown indoors:snowdrops, muscari, hyacinths, crocus, tulips, daffodils and narcissi are some of the most popular though. Daffodils, narcissi, crocus, muscari and other small bulbs look the best when they're planted in little groups, but hyacinths and tulips should only be planted in threes or even singly. Bulbs should be planted while they're in their dormant stage. That means that spring bulbs can be planted in autumn or winter, depending on the exact flower. Daffodils and crocuses are the first to flower so should be the first to get planted, you can plant them from September onwards – they usually fair well even if you end up planting them a lot later though, so there's no rush. Tulips usually flower later so they should go in from late November. There are summer bulbs as well, crinums, eucomis and galtonias for example, and these little guys should go into the ground in early spring. Seeing as you're keeping your bulbs indoor you don't need to be as strict with the timing, but once you plant them and start watering them you should keep them in a cooler spot so that they don't start flowering too early. It is actually possible to get your bulbs going early though if you're getting bored of winter and miss the colour and smell of growing flowers. Bulbs need moisture and plenty of drainage, so the best sort of soil for them is a mixture of equal parts peat moss potting soil, sand and perlite. If you're not a big gardener then you don't want to be buying lots of sacks of soil to mix, so go for something simple like a specialist indoor potting blend with added bonemeal. Putting pebbles in the bottom of your pots will help with the drainage. Fill your pot with soil half way and then drop in your bulbs, if the bulbs are still a long way beneath the lip of the pot put a bit more soil underneath them - you want their tops to be about two centimetres under the soil. Larger bulbs, such as hyacinths and tulips should be planted to about half or three quarters of their depth. If you're putting quite a few in the same pot then plant them a few centimetres apart. Bulbs fair best if they're planted the right way up, with their roots heading downwards and their heads heading upwards. For most varieties it's relatively obvious which way to plant them because their tops are pointed, but some flowers grow out of the underside of their bulb so it's not always perfectly clear. If you're unsure plant it sideways. Tulips bulbs have one flat side – this side should be planted towards the pot edge if that works for your arrangement. Give them a thorough watering when they first go in, as well as helping to get them started, this will make sure that the soil settles around them. Once your bulbs are in the soil you need to keep them in a cool and dark place while their roots and shoots start to grow – this is called plunging. Some people say that you're better off keeping them in a refrigerator, but it's not necessary – it is necessary to keep them cool though. If you don't have anywhere dark to put them put a box or rubbish bag over them. Keep them moist while they're in their plunging phase, which should take about three months for the earlier bulbs and four months for the later ones. The rule of thumb is that the longer you leave them to 'root' the bigger your plants will be – but once you start to see the shoots growing to about five to seven centimetres out of the ground you know it's time to take them out of the dark and put them somewhere cool and out of indirect light, keeping them moist as you do. At this stage you could start feeding them a low strength house plant fertilizer about once a week, but you don't need to. When the bud starts to get nice and plump and they look like they're on the way to blooming move them into direct sunlight, and once they do bloom move them out of it so that they last for longer. Depending on the temperature of your house your flowers may last up to two weeks. If it's very warm you're more likely to have them for less time. If you stagger the planting of your bulbs you can ensure that you can fill your house with flowers for longer. After your bulbs have flowered cut the flowers off and place the pots back in the sunlight – this is like re-charging your bulbs for next years blooms. Eventually the whole plant will die away and you'll just be left with the bulb again. At this point you can choose to plant them in the garden or let them rest until next year.